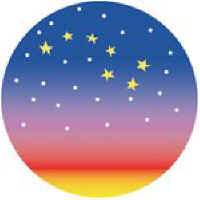 The evening stars are illuminated by the morning sky. The stars themselves flicker, as they wave goodbye. The moon smiles at all of us and bids us farewell. We have to wait for another night for its magic tales to tell. The Sun’s first rays of sunlight greet the morning. As the stars disappear they sing a cosmic hymn. The business of the day brings abundant opportunities for all. A new beginning, a new day of action if only we listen to the call. Everyday is like having our own magic wand. Look and seek the clarity that each day can bring. Everyday we can rise above the mundane and hearts and minds can sing. Then at the end of the day give thanks, meditate and rest. Remember in this world we are God’s invited guests. The evening stars come out and share our joy and happiness. At night we commune with God and finally realize we are truly blest.